Fernand Léger begins working in a cubist style under the influence of Cézanne and later Picasso and Braque. However, much more emphatically than his examples, he depicts figures and objects in volumes, such as the cone, the sphere and the cylinder. The cylinder appears so often in his work that a French critic even called him a ‘tubist’ instead of a cubist. In August 1914, at the start of the World War I, Léger is conscripted and deployed to the front for the construction of trenches. During his time at the front, he makes many drawings that he later develops into paintings. Soldiers playing cards was created during his convalescence in Paris after a poison gas attack. 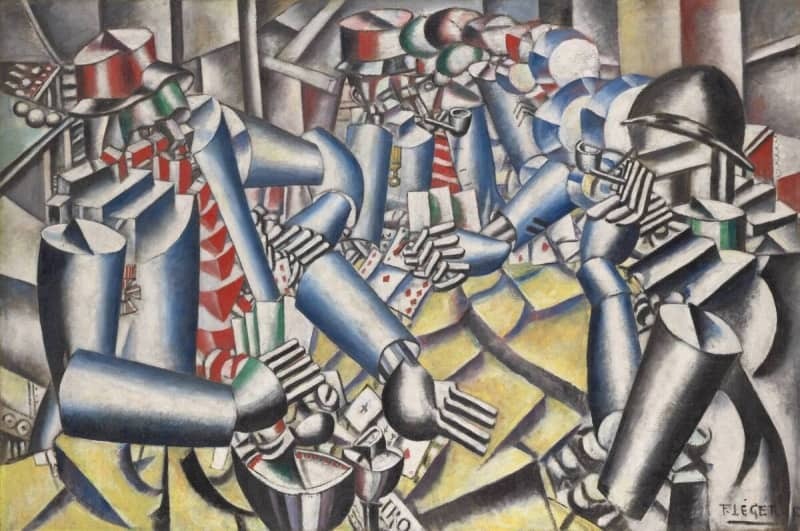 In this painting Léger combines cubism with the aesthetic of the machine. The soldiers are not people of flesh and blood, but look more like robots with their robust, geometric shapes and their arms like steel forged pipes. The recurring elements are reminiscent of the machinery of war. The alternation of small and larger areas of colour also lends the painting dynamism.